To get your Goffstown business listed on the Goffstown, NH facebook, contact: pammanney@comcast.net with “Goffstown business” in the subject – please include business contact info including social media pages. Also, feel free to post a one-time introduction about your business on the Goffstown, NH facebook page. This list will also be cross-published on my Facebook page, Goffstown, NH. The list will be meta-tagged for web search purposes. 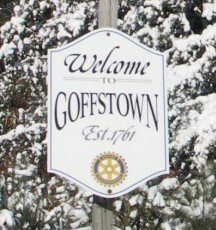 PLEASE NOTE: This page is not affiliated with the town of Goffstown, NH. Please Note: This is a free service.